Explanation: Large and dramatically shaped, this cosmic cloud spans nearly 7 degrees or 14 full moons across planet Earth’s sky toward the southern constellation Ara. 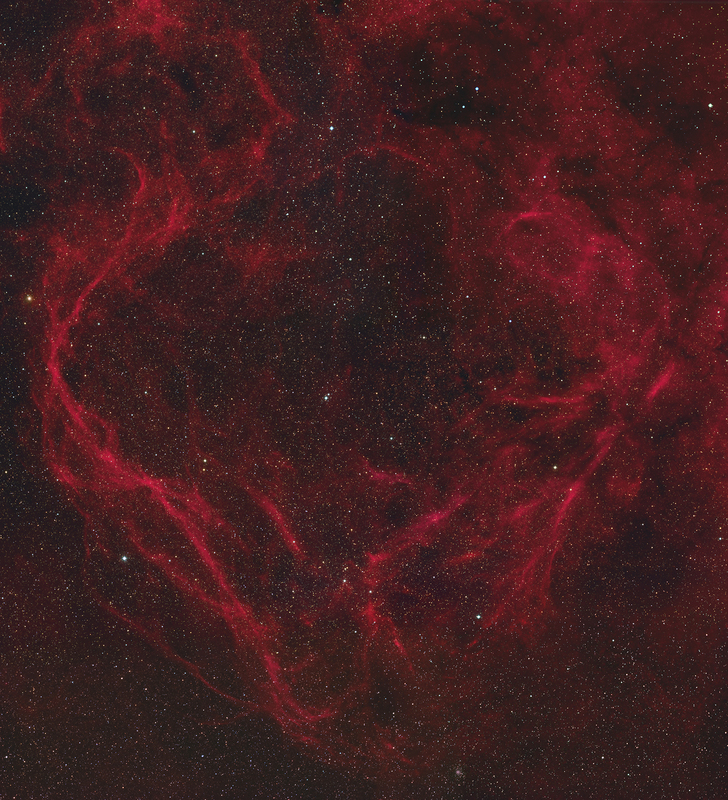 Difficult to image, the filamentary apparition is cataloged as RCW 114 and traced in this telescopic mosaic by the telltale reddish emission of ionized hydrogen atoms. In fact, RCW 114 has been recognized as a supernova remnant. Its extensive filaments of emission are produced as the still expanding shockwave from the death explosion of a massive star sweeps up the surrounding interstellar medium. Consistent estimates place its distance at over 600 light-years, indicating a diameter of about 100 light-years or so. Light from the supernova explosion that created RCW 114 would have reached Earth around 20,000 years ago. A neutron star or pulsar has recently been identified as the collapsed remains of the stellar core.